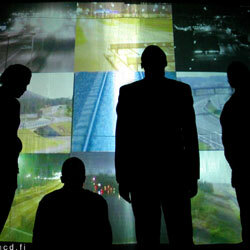 The Grey Zone is a soundscape exploration project by Finnish media art collective CNCD. Started in 1995, the project includes recorded sound, still images and video which are combined to reveal aspects of the Finnish subconsciousness. ‘The Grey Zone : Weather Matrix’ is a live ambient music concert with multi-screen projections. The visual material contains photographs and videos taken by CNCD during their sound safaris, the imagery thus originates partly in the same locations and situations as the sound. Another source for visual material is provided by the Finnish Road Administration which has several hundreds of cameras capturing photos for giving information on road conditions. CNCD has captured the still images of almost 200 road condition cameras from August 2003 till today. A software developed with Pseudotoad Laboratories enables a real-time manipulation and organization of this material, making it possible to transport the audience through the passage of day and night and the changing seasons weather.